Philadelphia Eagles linebacker Jordan Hicks celebrates a stop in the second half. It wasn't pretty. But then again, not many expected Sunday's game between the Philadelphia Eagles and the Minnesota Vikings to be a work of art, especially on the offensive side of the ball. What transpired at the Linc, however, didn't even look like football at times -- like in the first quarter when the two teams, who had turned the ball over three times coming into the game, traded turnovers back and forth for five straight possessions. Five. In a row. In fact, during a four minute and 21-second span early on, the Eagles offense turned the ball over three times, one more than it had during the first 300-plus minutes of the season. That could, and probably should, have been it right there, especially when you consider that all three turnovers occurred on the Eagles side of the field, including one that gave Minnesota first and goal from the two. But not to be outdone, Bradford and the Vikings turned the ball over twice during that same four-minute stretch, which was one more than their total through their first five games. Five turnovers. Before the first quarter was even halfway over. That, however, was only part of the story on Sunday. The Eagles ran 20 fewer plays than their opponent. They gained nearly 50 fewer yards. They lost the time of possession battle for the third game in a row. They were just 4-for-11 on third down, while the Vikings were 9-for-19. All that suggests a Minnesota win. Yet, here we are. 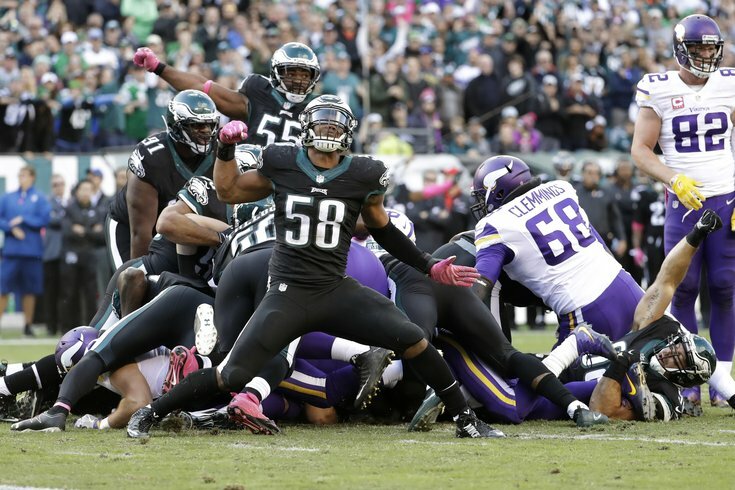 Here's a look at five reasons why the Eagles were able to pull off the upset -- and, more importantly, avoid falling to .500 -- with a 21-10 win over the previously undefeated Vikings. ... there are apparently plenty to go around. You really have to start with the turnovers in order to comprehend this one. Each team finished with four turnovers, but it could've been much worse -- if you're able to wrap your head around that for a second. Carson Wentz threw a pair of interceptions and also lost a fumble (as did Ryan Mathews). But Wentz actually fumbled two other times, both of which were recovered by the Eagles. As for the Vikings, it was one interception for Bradford and two lost fumbles (punt returner Marcus Sherels also lost a fumble). But, just like Wentz, Bradford fumbled a couple more times as well. He had the ball knocked out four times, but twice it was recovered by one of his teammates. The difference here is the timing and location of the turnovers. Or rather, what each team was able to do on the drive after their defense came up with the takeaway. During that aforementioned four-plus minutes of mayhem early in the first quarter, the Vikings failed to take advantage of the Eagles' mistakes. Following Wentz's first interception, Minnesota had first and goal from the two. They should've been guaranteed at least three points. Instead, it was a Rodney McLeod interception in the end zone on third and goal. Then, after Wentz fumbled, the Vikings again found themselves in the red zone. But on the very next play, Bradford was hit by Connor Barwin and stripped of the ball. That's two trips into the red zone in which the Vikings came away empty. Even if they settled for a field goal on both possessions, it would've been a very different game when Mathews fumbled (again) with a lead (again) in the last five minutes of a game (again). "It's huge. It's huge," Pederson said. "Our defense -- you look at Minnesota -- interception, fumble, on downs, they had a touchdown late in the game. Our defense playing as well as they did down there and stopping them. Again, it does start up front and the pressure on the quarterback. "I'll tell you what, it was fun to watch our defense today. That's the defense that we expect every week going forward." After failing to sack Kirk Cousins a week ago, the Eagles defense had its way with a depleted Vikings offensive line. Not only did they force four fumbles out of Bradford, but they also sacked him six times and hit him another dozen in the win. Six different Eagles players got in on the action: Barwin, McLeod, Brandon Graham, Jordan Hicks, Nigel Bradham, and Steven Means. And by the end of the game -- despite the Vikings late TD drive -- it was pretty clear that Bradford had enough. After not blitzing much through the first five games of the season, it appears Jim Schwartz went with the "if you can't beat 'em, join 'em" strategy against a Vikings team that was first in the NFL in sacks per game coming in. "I just think that any time you know a quarterback on the other team and kind of know the strengths and weaknesses and things like that, just trying to give him some different looks and put some pressure on him from different areas," Pederson said when asked about the increase in the number of blitzes. "It was a great game plan. The guys executed it extremely well. "Again, it starts up from, but just sometimes, just changing things up to help your guys be in position, we benefitted from that today and guys did a nice job." When the Vikings finally did get on the board -- a 12-play, 50-yard drive in the second quarter that ended with a 48-yard Blair Walsh FG -- their lead didn't last very long. In fact, I'll show you the entire time the Vikings had the lead on Sunday, because it was about the amount of time it takes Josh Huff to run 98 yards. Josh Huff is very VERY fast. That play really proved to be the difference on Sunday. "It was huge," Wentz said when asked what that return meant to the Eagles team. "Huff made some plays today. That kick return, and then anytime -- I mean you guys see it -- anytime you can get the ball in his hands, he's dynamic. That kick return, at that point in the game, kind of just got the game going a little bit. We were obviously struggling on offense and that was huge for us." Not only was it the second time in as many weeks that the Eagles returned a kick for a TD, something that they'd never done before in franchise history, but it also provided some points for a team that hadn't scored an offensive touchdown since the third quarter of their Week 5 game against the Lions. Huff's return, in fact, was their third straight return touchdown after Jenkins' interception return and Wendell Smallwood's kick return against the Redskins. Unlike his former teammate, Carson Wentz wasn't sacked once all game. That's a big improvement in the second game of Lane Johnson's suspension -- last week, Wentz was beat up all game long, getting sacked five times and getting hit on what seemed like every other passing play. A lot of that blame was put on Johnson's replacement, rookie Halapoulivaati Vaitai. But against the Vikings, Big V held his own. And that's not just a figure of speech. "Quite honestly, this game, I probably [didn't give Vaitai help] as much as I did last week," Pederson said postgame. "I felt like he kind of settled in this week, did a nice job. You know, the run game obviously helps when you can come off the ball and run. We were in some two tight end sets a little bit more today, and that obviously helped him a little bit. We'll evaluate the film tomorrow, but I thought overall he did a good job." Hey, Pederson wasn't asked about penalties during his postgame presser for the first time in what feels like forever. After committing 27 of them in their last two games combined, the Eagles had just seven penalties accepted against them. That, my friends, is a number we can live with.